"There’s an old Zen saying: the whole world’s upside down. In other words, the way the world looks from the ordinary or conventional point of view is pretty much the opposite of the way the world actually is. There’s a story that illustrates this. "Once there was a Zen master who was called Bird’s Nest Roshi because he meditated in an eagle’s nest at the top of a tree. He became quite famous for this precarious practice. The Song Dynasty poet Su Shih (who was also a government official) once came to visit him and, standing on the ground far below the meditating master, asked what possessed him to live in such a dangerous manner. The roshi answered, 'You call this dangerous? What you are doing is far more dangerous!' Living normally in the world, ignoring death, impermanence, and loss and suffering, as we all routinely do, as if this were a normal and a safe way to live, is actually much more dangerous than going out on a limb to meditate." "Bow to your own weakness, your own craziness, your own resistance. Congratulate yourself for them, appreciate them. Truly it is a marvel, the extent to which we are selfish, confused, lazy, resentful, and so on. We come by these things honestly. We have been well trained to manifest them at every turn. This is the prodigy of human life bursting forth at its seams, it is the effect of our upbringing, our society, which we appreciate even as we are trying to tame it and bring it gently round to the good. So we make offerings to the demons inside us and we develop a sense of humorous appreciation for our own stupidity. We are in good company! We can laugh at ourselves and everyone else." Bishop Michael Curry, the first African-American leader of the Episcopal Church, offered the most striking, soaring, the most deeply heartfelt sermon I have known: a testimony to the centrality of love in our spiritual tradition, in his words, “a movement grounded in the unconditional love of God for the world and a movement mandating people to live that love and in so doing to change not only their lives but the very life of the world itself.” Thirteen minutes long, it is better seen than read, and a video is available at https://www.nytimes.com/2018/05/19/style/bishop-michael-curry-royal-wedding.html. But Bishop Curry's sermon should be read as well, so I offer his text here. And now in the name of our loving liberating and life giving God, Father, Son and Holy Spirit, amen. The late Dr. Martin Luther King once said, and I quote: we must discover the power of love, the redemptive power of love, and when we do that we will make of this old world a new world. For love is the only way. There’s power in love. Don’t underestimate it. Don’t even oversentimentalize it. There’s power, power in love. If you don’t believe me, think about a time when you first fell in love. The whole world seemed to center around you and your beloved. There’s power, power in love. Not just in its romantic forms but any form, any shape of love. There’s a certain sense in which when you are loved and you know it, when someone cares for you and you know it, when you love and you show it, it actually feels right. There’s something right about it. And there’s a reason for it. The reason has to do with the source. We were made by a power of love. And our lives were meant and are meant to be lived in that love. That’s why we are here. The New Testament says it this way, “beloved, let us love one another because love is of God and those who love are born of God and know God, those who do not love do not know God. Why? For God is love. There’s power in love. There’s power in love to help and heal when nothing else can. There’s power in love to lift up and liberate when nothing else will. There’s power in love to show us the way to live. Set me as a seal on your heart. A seal on your arm. For love it’s strong as death. But love is not only about a young couple. Now the power of love is demonstrated by the fact that we are all here. Two young people fell in love and we all showed up. But it’s not just for and about a young couple who we rejoice with. It’s more than that. Jesus of Nazareth on one occasion was asked by a lawyer to sum up the essence of the teachings of Moses. He went back and reached back into the Hebrew scriptures, to Deuteronomy and Leviticus, and Jesus said you shall love the lord your God with all your heart, all your soul, all your mind and all your strength. This is the first and great commandment and the second is like it: love your neighbor as yourself. And then in Matthew’s version, he added, he said, on these two Love of God and Love of Neighbor, hang all the law, all the prophets, everything that Moses wrote, everything in the holy prophets, everything in the scriptures, everything that God has been trying to tell the world. Love God, love your neighbors, and while you’re at it, love yourself. Now someone once said that Jesus began the most revolutionary movement in all of human history, a movement grounded in the unconditional love of God for the world. A movement mandating people to live that love. And in so doing, to change not only their lives but the very life of the world itself. Love is not selfish and self-centered. Love can be sacrificial. And in so doing, becomes redemptive, and that way of unselfish, sacrificial, redemptive love, changes lives. And it can change this world. If you don’t believe me, just stop and think or imagine. Think and imagine, well, think and imagine a world where love is the way. Imagine our homes and families when love is the way. Imagine neighborhoods and communities where love is the way. Imagine governments and nations where love is the way. Imagine business and commerce when love is the way. Imagine this tired old world when love is the way, unselfish, sacrificial redemptive. When love is the way, then no child will go to bed hungry in this world ever again. When love is the way, we will let justice roll down like a mighty stream and righteousness like an everflowing brook. When love is the way, poverty will become history. When love is the way, the earth will be a sanctuary. When love is the way, we will lay down our swords and shields down, down by the riverside to study war no more. When love is the way, there’s plenty good room, plenty good room, for all of God’s children. Because when love is the way, we actually treat each other, well, like we are actually family. When love is the way, we know that God is the source of us all and we are brothers and sisters, children of God. My brothers and sisters, that’s a new heaven, a new earth, a new world, a new human family. And let me tell you something, old Solomon was right in the Old Testament, that’s fire. Pierre Teilhard de Chardin and with this, I will sit you down. We’ve got to get you all married. French Jesuit Pierre Teilhard de Chardin was arguably one of the great minds, one of the great spirits of the 20th century. A Jesuit, Roman Catholic priest, scientist, a scholar, a mystic. In some of his writings, he said from his scientific background as well as his theological one. In some of his writings, he said as others have, that the discovery or invention or harnessing of fire was one of the great scientific and technological discoveries in all of human history. Fire to a great extent made human civilization possible. Fire made it possible to cook food and to provide sanitary ways of eating which reduced the spread of disease in its time. Fire made it possible to heat warm environments and thereby made human migration around the world a possibility, even into colder climates. Fire made it possible, there was no Bronze Age without fire, no Iron Age without fire, no industrial revolution without fire. The advances of science and technology are greatly dependent on the human ability and capacity to take fire and use it for human good. Anybody get here in a car today? An automobile? Nod your heads if you did, I’m guessing, I know there were some carriages. But those of us who came in cars, the controlled harnessed fire made that possible. I know that the Bible says, and I believe it, that Jesus walked on the water, but I have to tell you I didn’t walk across the Atlantic Ocean to get here. Controlled fire in that plane got me here. Fire makes it possible for us to text and tweet and email and Instagram and Facebook and socially be dysfunctional with each other. Fire makes all of that possible and de Chardin said that fire was one of the greatest discoveries in all of human history. And he then went on to say that if humanity every harnesses the energy of fire again, if humanity ever captures the energy of love, it will be the second time in history that we have discovered fire. Dr. King was right, we must discover love. The redemptive power of love. And when we do that, we will make of this old world a new world. My brother, my sister, God love you. God bless you. And may God hold us all in those almighty hands of love. For Norman's full essay, see lionsroar.com. There’s an old Zen saying: the whole world’s upside down. In other words, the way the world looks from the ordinary or conventional point of view is pretty much the opposite of the way the world actually is. There’s a story that illustrates this. Once there was a Zen master who was called Bird’s Nest Roshi because he meditated in an eagle’s nest at the top of a tree. He became quite famous for this precarious practice. 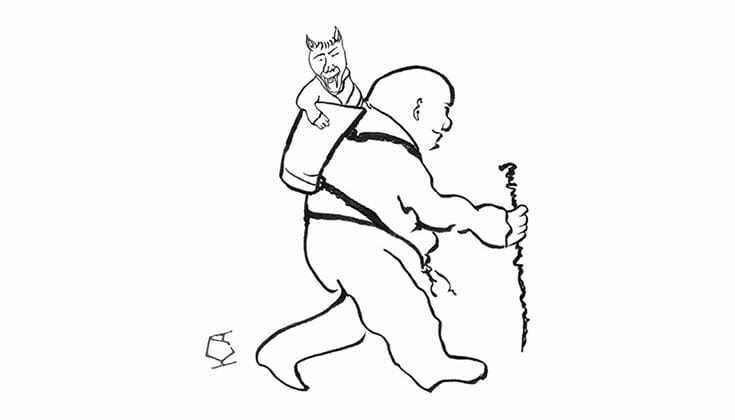 The Song Dynasty poet Su Shih (who was also a government official) once came to visit him and, standing on the ground far below the meditating master, asked what possessed him to live in such a dangerous manner. Theroshi answered, “You call this dangerous? What you are doing is far more dangerous!” Living normally in the world, ignoring death, impermanence, and loss and suffering, as we all routinely do, as if this were a normal and a safe way to live, is actually much more dangerous than going out on a limb to meditate. While trying to avoid difficulty may be natural and understandable, it actually doesn’t work. We think it makes sense to protect ourselves from pain, but our self-protection ends up causing us deeper pain. We think we have to hold on to what we have, but our very holding on causes us to lose what we have. We’re attached to what we like and try to avoid what we don’t like, but we can’t keep the attractive object and we can’t avoid the unwanted object. So, counterintuitive though it may be, avoiding life’s difficulties is actually not the path of least resistance; it is a dangerous way to live. If you want to have a full and happy life, in good times and bad, you have to get used to the idea that facing misfortune squarely is better than trying to escape from it. This is not a matter of grimly focusing on life’s difficulties. It is simply the smoothest possible approach to happiness. Of course, when we can prevent difficulty, we do it. The world may be upside down, but we still have to live in this upside-down world, and we have to be practical on its terms. The teaching on transforming bad circumstances into the path doesn’t deny that. What it addresses is the underlying attitude of anxiety, fear, and narrow-mindedness that makes our lives unhappy, fearful, and small. Transforming bad circumstances into the path is associated with the practice of patience. The first slogan, Turn all mishaps into the path, sounds at first blush completely impossible. How would you do that? When things go alright we are cheerful—we feel good and have positive spiritual feelings—but as soon as bad things start happening, we get depressed, we fall apart, or, at the very best, we hang on and cope. We certainly do not transform our mishaps into the path. And why would we want to? We don’t want the mishaps to be there; we want them gone as soon as possible. Yet, the slogan tells us, we can turn all of this into the path. We do that by practicing patience, my all-time favorite spiritual quality. Patience is the capacity to welcome difficulty when it comes, with a spirit of strength, endurance, forbearance, and dignity rather than fear, anxiety, and avoidance. None of us likes to be oppressed or defeated, yet if we can endure oppression and defeat with strength, without whining, we are ennobled by it. Patience makes this possible. In our culture, we think of patience as passive and unglamorous; other qualities like love or compassion or insight are much more popular. But when tough times cause our love to fray into annoyance, our compassion to be overwhelmed by our fear, and our insight to evaporate, then patience begins to make sense. To me it is the most substantial, most serviceable, and most reliable of all spiritual qualities. Without it, all other qualities are shaky. The practice of patience is simple enough. When difficulty arises, notice the obvious and not so obvious ways we try to avoid it—the things we say and do, the subtle ways in which our very bodies recoil and clench when some- one says or does something to us that we don’t like. To practice patience is to notice these things and be fiercely present with them (taking a breath helps; returning to mindfulness of the body helps) rather than reacting to them. We catch ourselves running away and we reverse course, turning toward our afflictive emotions, understanding that they are natural in these circumstances—and that avoiding them won’t work. We forestall our flailing around with these emotions and instead allow them to be present with dignity. We forgive ourselves for having them, we forgive (at least provisionally) whoever we might be blaming for our difficulties, and with that spontaneous forgive- ness comes a feeling of relief and even gratitude. This may strike you as a bit far-fetched, but it is not. Yet it does take training. We are not, after all, talking about miracles; we are not talking about affirmations or wishful thinking. We are talking about training the mind. If you were to meditate daily, bringing up this slogan, Turn all mishaps into the path, in your sitting, writing it down, repeating it many times a day, then you could see that a change of heart and mind can take place in just the way I am describing. The way you spontaneously react in times of trouble is not fixed. Because you will have realized that because you are alive and not dead, because you have a human body and not some other kind of a body, because the world is a physical world and not an ethereal world, and because all of us together as people are the way we are, bad things are going to happen. It’s the most natural, the most normal, the most inevitable thing in the world. It is not a mistake, and it isn’t anyone’s fault. And we can make use of it to drive our gratitude and our compassion deeper.